Raven Armoury is a small company set in the heart of the Essex countryside. Over the past three decades they have forged an enviable reputation for fine quality, hand-made swords. 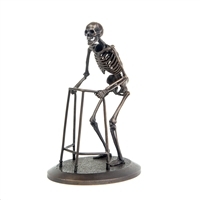 During this time Simon Fearnhamm, the founder of Raven Armoury, has also become renowned for his sculpture work, mostly involving skeletons and bones. SKELEMENTAL represents the sculpture aspect of Raven Armoury. 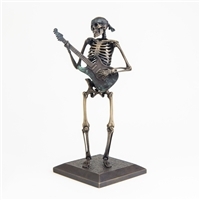 Working with his sons, Robin, Thomas and Maxim, Simon creates skulls and skeletons in all manner of sizes and poses, some are original works of art and others are produced as small limited editions. Each piece is carefully sculpted in wax then lost-wax cast into steel, bronze or silver. Their Thaxted Gallery is open Mondays to Fridays 10am to 6pm, at weekends and other times by appointment. Simon is often to be found forging very late into the night so evening visits are not usually a problem. Gallery and postal address: Raven Armoury, Handleys Farm, Dunmow Road, Thaxted, Essex, England. CM6 2NX. Copyright © 2013 Raven Armoury. All Rights Reserved. Built with Volusion.